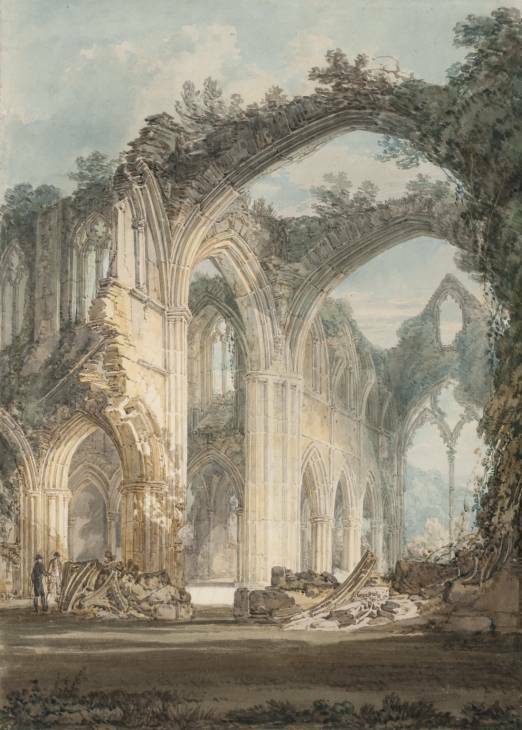 In the early 1780s, the English artist, author and Anglian priest William Gilpin (1720-1804) visited the ruined Tintern Abbey on the banks of the river Wye on the Welsh borders, remarking that its ruins were too perfect, too well preserved, and should be made more ruinous to be pleasing to the eye. Gilpin writings about the picturesque in relation to ruins would go on to influence a whole host of ruin obsessives, from artists such as J. M. W. Turner (1) to the urban explorers of today. Gilpin’s remarks about Tintern Abbey flag up the question as to what makes a ruin ‘authentic’. Is an aesthetic appreciation of ruins dependent on them being ‘remade’ in the eye of the beholder? Or do ruins possess an inherent beauty that transcends the subjective vision of the observer? On a recent visit to Ironbridge (for a conference on the landscapes of iron and steel), the keynote speaker Sir Neil Cossons drew attention to new plans for the World Heritage Site, which sprawls for several miles along the River Severn in the Ironbridge Gorge. 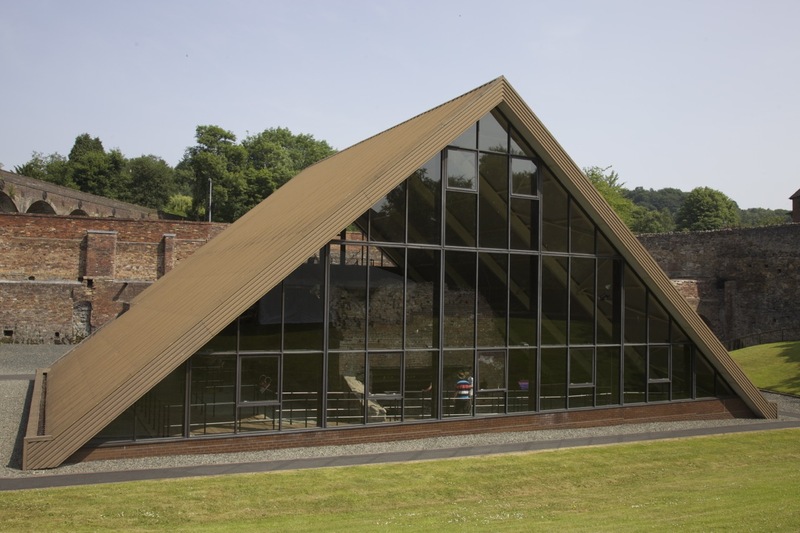 As Cossons related, there are currently plans to ‘re-wild’ some of Ironbridge’s industrial ruins, particularly Coalbrookdale’s original coke-powered blast furnace that kick-started the industrial revolution in Britain and which now sits in ruins beneath a triangular steel and glass structure to protect it from further decay (2 & 3). 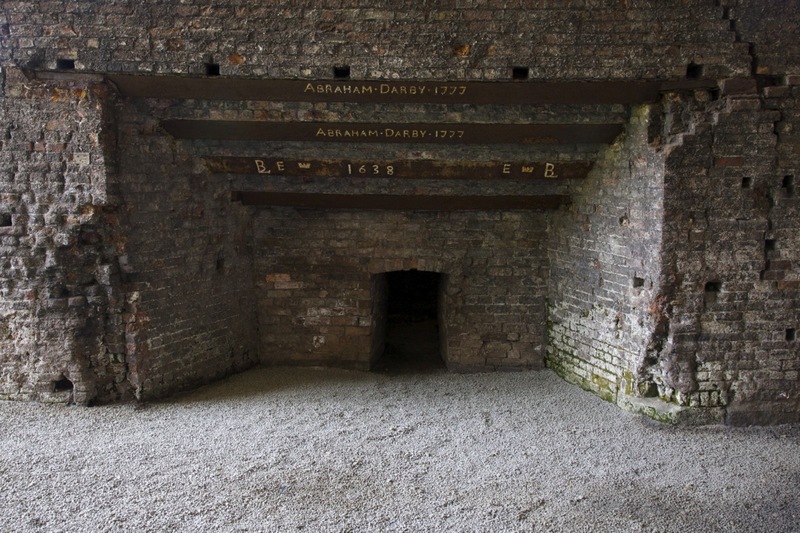 Cossons argued for a new approach to the museumification of sites like Coalbrookdale’s blast furnace, one that bridges the gap between ruin and the imagination without killing the ‘romance’ of the former. An important aspect of the appeal of any ruins is a sense of their authenticity, that is, as sites that have been left free of human intervention and allowed to be restored to the ‘natural’ cycles of decay. 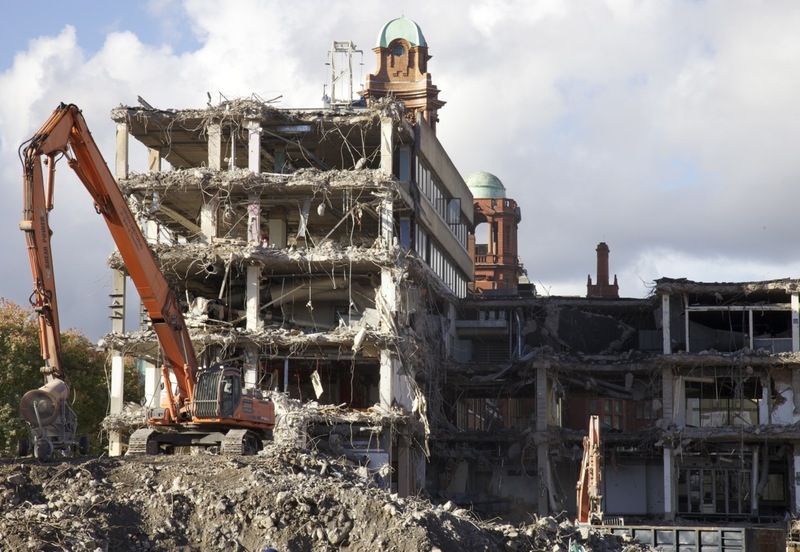 So, when those processes are speeded up, whether by demolition or total destruction by war, fire, or natural disasters, ruins lose their capacity to signify: like the recent demolition of the old BBC building in Manchester, where destruction progressed from ruin to rubble within a matter of days (4). Once a ruin becomes rubble it no longer signifies anything other than annihilation. In one sense, ruins are appreciated only when seemingly petrified; yet, it is a fine line between petrification and restoration, the latter resulting in the deadening of the edgy restlessness of the ruin. 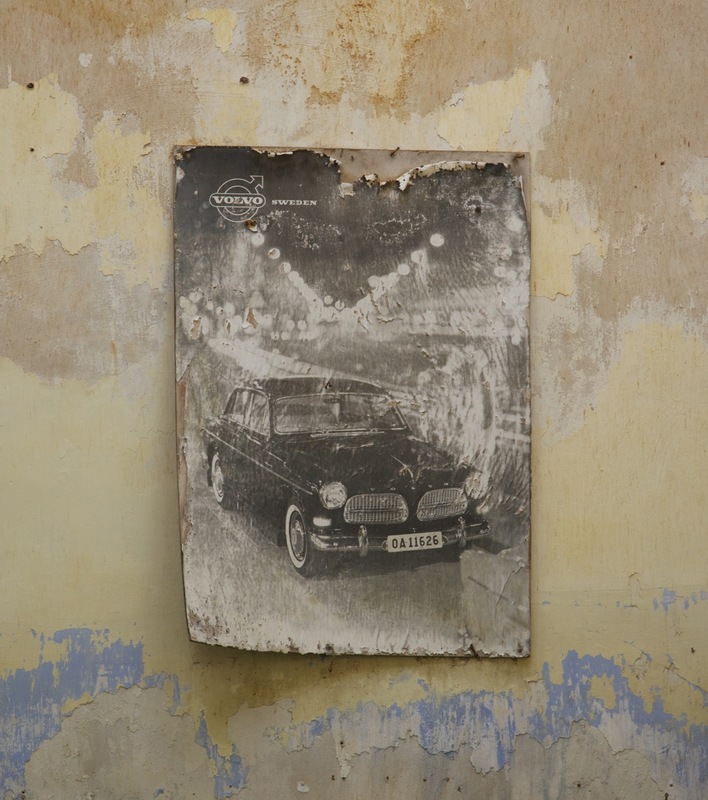 In one sense, for ruins to matter, they have to obey certain rules, whether expressed in Gilpin’s aesthetic of the picturesque or in more recent photographs of ruins by urban explorers. Thus, just as Gilpin looked for certain features in ruins that made them aesthetically pleasing, so urban explorers, time and again, focus in their photographs on the visual appeal of abandoned spaces, whether the geometric simplicity of sewer tunnels, the panoramic spectacle from the top of a ruined power station, or the intimate textures of industrial decay (5). All this points to an essential contradiction at the heart of the search for authenticity in ruins. For, even as ruins are desired because they seem to stand outside our subjectivity, the very act of perceiving ruins dissolves their authenticity. Perhaps the only authentic ruins are those that have not yet appeared, or those that have never been seen. Another fine post. It is significant that so many artists / writers are drawn to images of industrial decay. Surely it’s not simply a hangover from Turneresque romanticism. Could it be that these ruins are an outward reflection of the growing certainty that this unsubstantial pageant is rapidly fading and will leave not a wrack behind? Reading this post made me think of Richard Greaves’s work which I recently saw at the Hayward Gallery. Despite their run-down appearance, these wood constructions in Canada’s forest were actually solid. 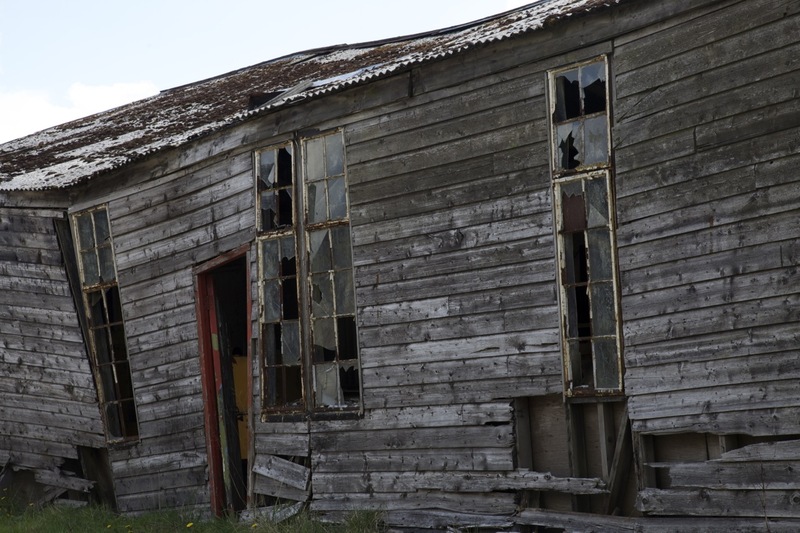 Perhaps they were the perfect ruin – a ruin which always seems about to change but always remains the same? As it s the result of a violent change, rubble destroys the sense of endangered permanence of the ruined building. It also abruptly changes a known urban landscape in something different, which needs to be newly negotiated. This is perhaps why rubble instantly loses significance, as you insightfully say in your post. I was also thinking that perhaps there is another aspect of modern appreciation for old industrial machinery. This is the contrast between the ingenuity of these inventions at the time they were constructed, and their naivety to the modern eye. Here I am thinking of early means of transportation or household appliances rather than the large scale coke works you mention at the beginning of your post. Do you think this other aspect is at all visible in our relationship to ruins such as Coalbrookdale? P.S. I really enjoy reading your blog! Many thanks for this incisive comment! I think old machinery appeals because it seems more ‘transparent’ in its truth content than ours today, particularly if we have equivalent things that still exist (like cars or telephones). As machinery evolves it tends to do so in a way that gradually conceals how it works (I guess that’s called ‘efficiency’). Also, we tend to immediately read old things aesthetically rather than functionally, which is again why they gain added value. Yet, I think there’s certain distance between the old and the new that is necessary for this value to be added, that is, the difference between an ‘defunct’ object (ie. just out of date) and one that gains a certain aesthetic value because of its age.